The Southern Methodist University Executive MBA Program at The Cox School of Business is a 21-month part-time program designed for experienced business leaders looking to take their career to the next level. Classes for this program are held Fridays and Saturdays on alternating weekends. Friday classes are held in a morning session and an afternoon session. The program is conducted in a cohort structure. Students in the Executive MBA program will receive an education that emphasizes general management practices. The program also emphasizes strategy and finance. During the first half of the program, students will cover an array of business skills. In the second half they will focus on real-world applications. Students in the Executive MBA program participate in a global studies trip. During the trip, students get to witness and experience the business practices and political climate of the country that they are in first hand. Students also have the opportunity to participate in business plan competitions and pitch their business ideas to angel investors and venture capitalists through the program’s entrepreneurship course. The Executive program at SMU Cox attracts successful business leaders with an average of 15 years of professional work experience and nine years of management experience. There are typically 80 to 90 students enrolled in the EMBA program. The average age of Executive MBA students is 37. Work experience ranges from eight to 38 years. The Southern Methodist Executive MBA program at The Cox School of Business prepares business leaders to move into higher executive level positions or to expand their company’s reach. Students in the EMBA program have access to career management resources such as resume review, career counseling, industry information sessions, mock interviews, networking events, executive mentoring and Cox student and alumni groups. Students also have access to the Business Leadership Center. The BLC offers specialized training in leadership, communications and interpersonal skills. EMBA students also have access to The Cox Associate Board, which gives students the opportunity to meet successful business leaders and work one-on-one with one of the school’s 200 executive mentors. Students also have access to the Career Management Center. The CMC provides career advisory services such as career assessment, planning, resume review and coaching. 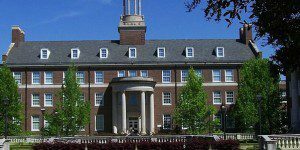 The tuition for the Southern Methodist University EMBA program is currently $120,150. The tuition covers the cost of academic cases, use of the Business Information Center, parking, meals on each class day, lodging, some airfare and some meals associated with the required global trip. In addition students must also pay a $2,800 nonrefundable payment (not applied towards tuition) that guarantees their place in the class after acceptance to the program. 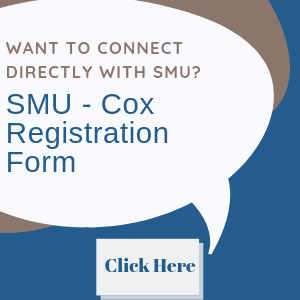 In order to be considered for admission for the Southern Methodist Executive MBA program at the Cox School, applicants can first send their resume and a cover letter to dteems@cox.smu.edu in order to schedule an initial phone interview. After the phone interview is completed, applicants should complete the online application form and send a copy of their current resume and cover letter, all official undergraduate and/or graduate transcripts, answer the two essay questions and complete the action plan (found on the online application) and provide two letters of recommendation (one from a senior manager of the sponsoring company and one from an immediate supervisor or colleague with an MBA). Once all application materials have been received, the Executive MBA office will contact the applicant for an in-person interview, if appropriate. An admissions decision will be given within two weeks of the interview. Prospective students are required to have at least eight years of professional work experience. The GMAT/GRE is not required for this program.